D&AD Annual award 2005 (‘Energy: Fuelling the Future’ gallery, Science Museum, London). D&AD Silver Nomination for Outstanding Achievement 2005 (‘Energy: Fuelling the Future’ gallery, Science Museum, London). 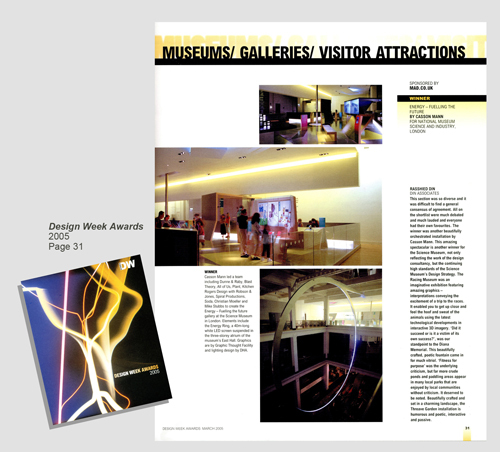 Design Week winning award for Best Exhibition Design 2005 (‘Energy: Fuelling the Future’ gallery, Science Museum, London). International Visual Communications Awards IVCA Gold Award 2005 (‘Energy: Fuelling the Future’ gallery, Science Museum, London). D&AD Annual award 2005 (‘Energy Ring’ at the Science Museum, London). D&AD Silver Nomination for Outstanding Achievement 2005 (‘Energy Ring’ at the Science Museum, London). Nominated for a BAFTA Interactive Award 2005 (‘Energy Ring’ at the Science Museum, London). D&AD Highly commended award 1999 (‘Centenary Gallery’, Horniman Museum, London). D&AD Highly commended award 1999 (‘African Worlds’ gallery, Horniman Museum, London). WJEC 2014 ‘FADEx Overall Winner Award’ (Foundation Diploma in Art and Design). WJEC 2014 ‘FADEx Highly Commended Award’ (Foundation Diploma in Art and Design). Cardiff Design Festival 2010 ‘Winner: Welsh Graduate Design Award’ (BA(Hons) Interior Architecture). New Designers Show London 2008 ‘Spatial Design Top Prize’ (BA(Hons) Interior Architecture). New Designers Show London 2009 ‘Spatial Design Top Prize’ (BA(Hons) Interior Architecture). FormZ Joint Study ‘Interior Design CAD Winner Award’ 2008 (BA(Hons) Interior Architecture). FormZ Joint Study ‘Interior Design CAD Winner Award’ 2009 (BA(Hons) Interior Architecture). FormZ Joint Study ‘Interior Design CAD Winner Award’ 2010 (BA(Hons) Interior Architecture).